Sauna had a huge importance in our lives in the old days. It was a place to give birth and a place where death bodies were washed before funerals. You can still find people in Finland who were born in the sauna. Sauna was the place to wash yourself when there was no running hot water. Sauna provided warmth, which in cold climate was highly appreciated. 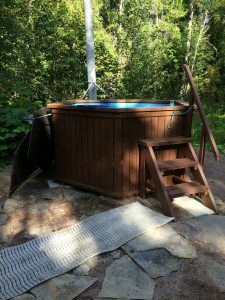 For us Finns sauna still has a huge importance, and it is just as popular in the summer as in the winter. 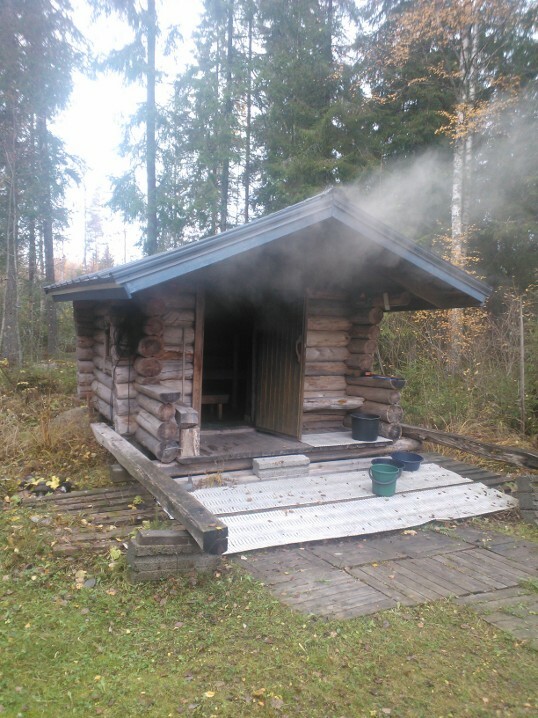 Many Finnish expats build saunas for their new homes even in hot climates and for example Finnish soldiers serving as UN peacekeepers have a strong tradition of sauna building. 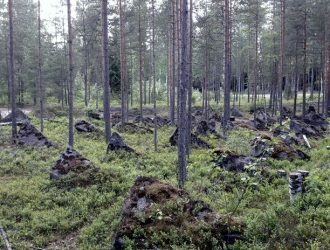 In fact, the Finnish troops build saunas saunas at every base they occupy. Sauna provides a taste of home, a chance to rejuvenate and relax, and strengthen the spirit of the corps. Many claim it makes you feel refreshed even in extremely hot weather. When you visit Finland, you will see for yourself how every Finnish resident will have their own sauna. There are 5 million inhabitants and over three million saunas in Finland. Hotels will always have it as an amenity and they either have separate saunas for women and men, or different times for women and men for when the sauna is available in the evenings. Have you ever seen the Finnish Parliament House in Helsinki? It has a sauna as well. Sauna has a number of real health benefits on top of mental relaxation. The heat makes your organs work as if you were doing mild exercise, so you might burn a few extra calories, and it lowers blood pressure. The heat from the sauna allows the muscles to relax and can speed up healing and recovery time, allowing a more rapid return to your workout without experiencing continual muscle pain. While sauna is good for the health, we must acknowledge fine particle emissions generated by burning wood. 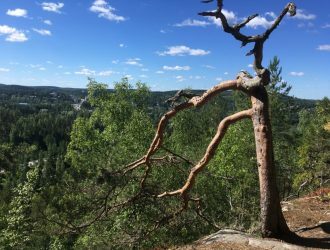 In Finland the air quality is the best in the world, but we want to keep it that way. When burning wood, it is important to ensure good combustion and a sufficient air supply. Poor combustion creates lots of smoke, which has a negative effect on both neighbourly relations and health in dense single-family dwelling areas. For example approximately a quarter of combustion-based fine particle emissions in the Helsinki Metropolitan Area come from use of fireplaces. Of these, 50% are from standard fireplaces and 45% from wood-burning sauna stoves. The efforts people make for the better and cleaner combustion include burning only dry and clean wood in saunas and fireplaces, lighting the fire correctly and letting the fire have enough air, storing dry wood in a ventilated wood shed, and making sure that chimneys are swept regularly. 1. Heat the sauna to 80–110 °C. 2. Shower first – you should be clean before entering the sauna. 3. Go to sauna naked – in public saunas there are usually separate sections for men and women. 4. Pour water over the stove (kiuas in Finnish) to produce steam (löyly) and further raise the temperature. This applies also to electric saunas and smoke saunas. Sauna is not a sauna without the steam. 5. 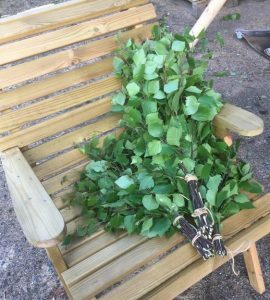 Whip yourself with a bunch of silver birch leaves (vihta) – dip them in the water bucket and use them to lightly whip yourself over the shoulders and on your legs, it improves blood circulation and stimulates the skin. The aroma of the wet birch leaves is part of the experience. 6. 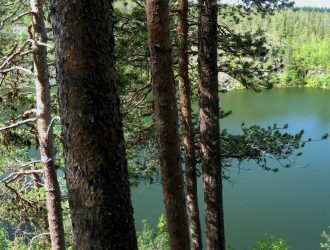 The classic sauna experience includes a dip in the lake afterwards, returning to the sauna, and then repeating the process. In the winter this means ice-swimming, where you plunge into a hole cut into the ice (avanto). Rolling in the snow also happens. 7. Washing with soap or shampoo is generally part of the sauna routine, usually towards the end of the whole procedure. One old tradition is to have a washer service in the sauna. We even used to have a TV program where interviews were being made to high level politicians and other famous people by a washing-lady. So we have all seen our President in the sauna. 8. Enjoy a drink or a meal after sauna. The Finns usually enjoy beer – nice and cold. Do we go to sauna naked and who do we go there with? There are unwritten and written rules about these. In public Finnish saunas it is actually forbidden to go to sauna wearing a swimsuit as it’s not hygienic. You may sometimes go to sauna with a towel on, or at least you can always have your own placemat (pefletti) or small towel to sit on. In gatherings with friends and family it may be agreed that each family goes to sauna in their own turn, but usually women go together and men after that when the sauna is even more hot. Teen-agers usually stop going to sauna with their parents at certain age, but this depends of the family. Now when open-air hot tubs (palju) have become common, people usually wear swimsuits and all go at the same time. Sauna boats and hot tub boats are also commonly found in Finland. It is not uncommon to invite business partners to sauna, and many deals have been made in the warm embrace of löyly. We also used to host the Sauna World Championships, but that event has been terminated after a Russian participant died and a Finnish participant seriously injured in the competition. I have a traditional smoke sauna at my cottage. It’s a wood-fired sauna where smoke is intentionally directed into the sauna to give the aroma of burning wood. It is normally heated for approximately 5-8 hours, with a door open, allowing the smoke to go out from the door. The smoke makes sauna black and white towels are not recommended. After the heating has been finished and the rest of the coal taken out from the stove, a first round of water is poured over the stove. That smoke still goes out from the door and shouldn’t be inhaled. After that the sauna is ready to be used normally, and there is no asphyxiation involved. But the aroma remains, and it is absolutely delightful. Traditional smoke saunas are usually believed to be the best saunas there are. I fully agree with that. We only use the traditional smoke sauna in the summer in special occasions. 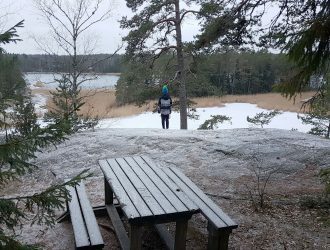 Where can you find a sauna in Finland? 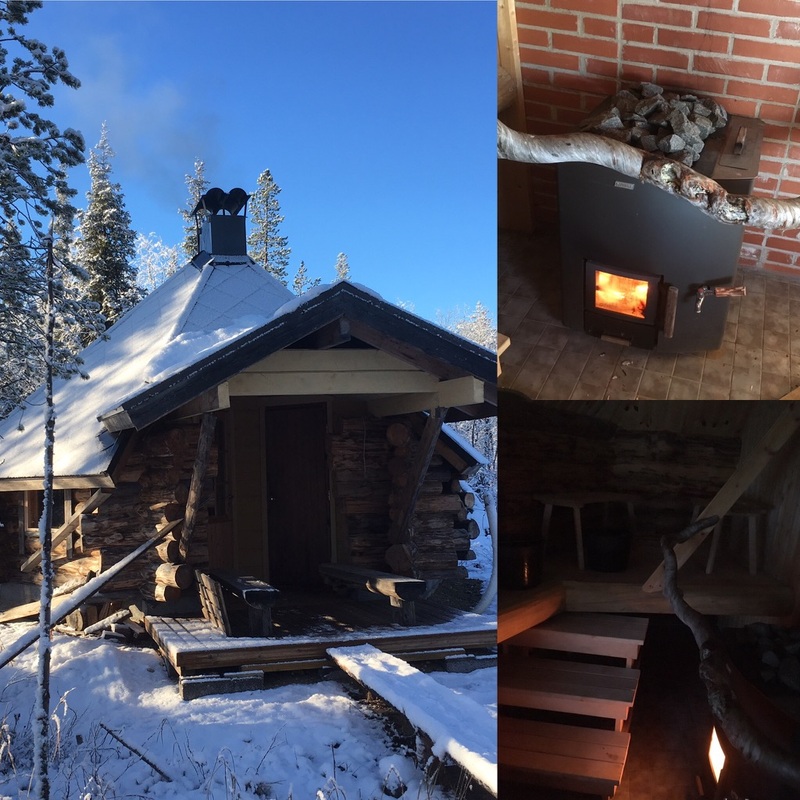 If you haven’t been invited to the traditional smoke sauna yet, you can experience it for example in Tammela, about 95 km from Helsinki. Korteniemi Heritage Farm has a very old smoke sauna from 18th century, and it may be rented for groups. The farm is staffed by a national park guide from May until September and the smoke sauna available for rent during its opening hours. Contact information: Metsähallitus Customer Service at hame(at)metsa.fi, tel. +358 206 39 4630. The price (300€) includes a tour in Korteniemi Heritage Farm, heating the sauna, cleaning, and instructions for using the sauna. There are several public saunas in Helsinki, you can find them from here. Ice-swimming is also a common hobby in many public saunas in the capital area in winter. For some reason the Central Finland is said to be the sauna region in the country. I’m not sure why because there are saunas everywhere. But for example Jyväskylä has many sauna boats in the middle of the city, ready to take you for a cruise. Check out the sauna boats and other saunas in central Finland in here.